"A girl and her journey to become a great detective." Sheryl Holmes has always loved Sir Arthur Conan Doyle's stories about his great detective. Inspired by the stories and deciding that she wasn't given her surname by chance, Sheryl has opened up the 221B Baker Detective Agency so that she can become a great detective herself. Taking on cases, meeting other detectives, solving mysteries; Sheryl has a learn to lot. Is she just a fan with delusions of grandeur? Does she even have the skills to become a great detective? Well, that's another mystery that Sheryl Holmes will have to solve. Sheryl Holmes' 221B Baker Detective Agency has not been tagged yet. 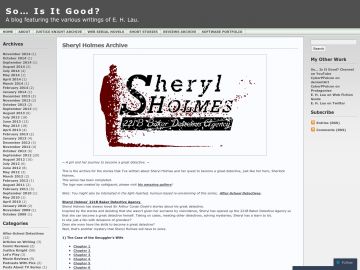 Help others find Sheryl Holmes' 221B Baker Detective Agency by tagging it! Sheryl Holmes' 221B Baker Detective Agency has not been reviewed yet. Sheryl Holmes' 221B Baker Detective Agency has not been recommended yet.